Herefordshire Council would like to thank the public for their patience whilst it reviews the position relating to the unexpected discovery of asbestos at Hereford Library. The safety of users and staff of the services is our most important consideration, and the implications of managing asbestos at the building needs to be carefully considered. As traces of asbestos have been found at the venue, it is in the best safety interest to remove it completely, which will be started as soon as possible. As yet we have not been given a date as to when those works will be completed. We have seen considerable increase in the use of Belmont Library to compensate for the closure of Hereford Library, and a drop-off point is available at the Shirehall. In addition we plan to open a temporary provision at Hereford Town Hall as soon as we can. Options for temporary relocating the Museum and Arts Gallery are being explored. In addition to the public use PCs at Belmont library there are also public access PCs available at the new HARC building at Rotherwas and at the Courtyard, which are free to use. We will provide further updates on the library as soon as we have them. Though the risk from asbestos is minimal, if you have health concerns please contact your GP in the first instance. 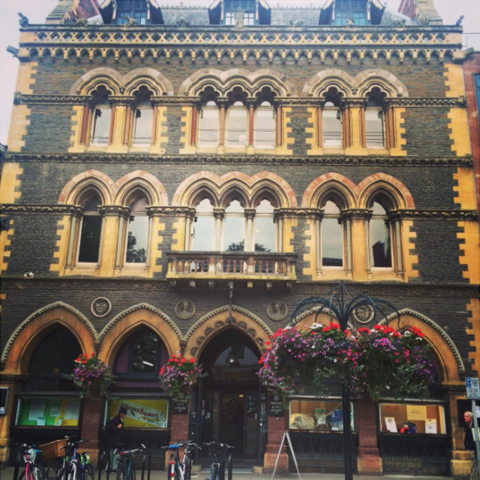 We have received a number of queries relating to the closure of Hereford Library and Museum and have developed some frequently asked questions (FAQs) to help answer as many of these as possible. Please be advised that alternative library facilities, including computer access, are located at Belmont Library and during the temporary closure of Hereford Library will operate extended hours. Thank you to South Wye Community Association for its support. Belmont library has free parking for community centre visitors and is located on bus routes 39, 39A, 74, 74A, 75, 75A, 79A, 440, 447, 449 and X4. You can also renew your library books online or call 01432 383295. Alternative public computer access is available at The Courtyard in Hereford, please contact them directly for more information. Green bags for garden waste can be purchased from The Hereford Centre at Franklin House in Hereford. We will endeavour to find an alternative venue for the Spun Gold exhibition, but regret that the exhibition is currently closed. The Old House museum will extend its hours, as an alternative attraction. Herefordshire Council appreciate your patience during this time and will seek to provide other services as they become available. In the interest of public and staff safety, Herefordshire Council has made the decision to temporarily close Hereford Library and Museum with effect from today, due to the discovery of trace levels of asbestos found in the building as a result of planned building work due to take place at the site. The building will be closed for an initial 12 week period, while the remedial works and improvements to the site are conducted. Air samples had showed there were no airborne particles of asbestos, however trace amounts were found on surfaces near the oldest parts of the building's structure. Herefordshire Council would like to stress that the risk of contamination is minimal, however it is important we take risk seriously and take the appropriate action to safeguard our staff and customers. The Health and Safety Executive has been informed and the library service is assessing the impact on the wider library service and what actions can be taken to address and mitigate the impact of the closure in the best interest of customers. There is more information on asbestos on the Health and Safety Executive website.